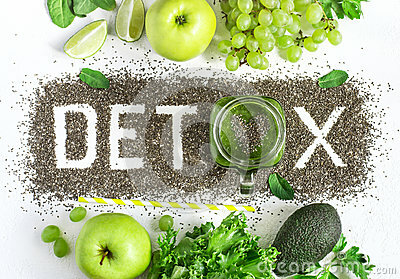 Word detox is made from chia seeds. Green smoothies and ingredients. Concept of diet, cleansing the body, healthy eating. Heart Shaped Fruit Arrangement with the word Live and glass window . Sugar addiction suggested by spilled white sugar crystals forming a skull. Diabetes mellitus concept.